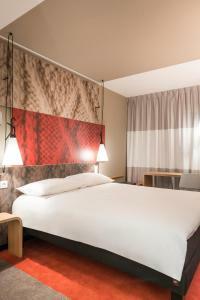 Located in central Paris, ibis Paris Gare du Nord La Fayette is just a 5-minute walk from Gare du Nord, which offers direct access to Villepinte Exhibition Centre and Stade de France. 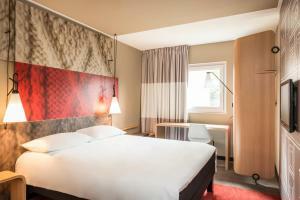 All of the air-conditioned rooms at ibis Paris Gare du Nord La Fayette have wooden floors, a flat-screen TV and a private bathroom. A buffet breakfast composed of sweet and savoury dishes such as eggs, fruit salad, yogurts and juices is served every day. Pastries baked on site and fresh French Madeleine cakes are also on offer, as well as a hot beverage and a piece of fruit to take away. Outside of regular breakfast hours guests can also enjoy a lighter option, available from 04:00. A 24-hour snack bar is available to guests. 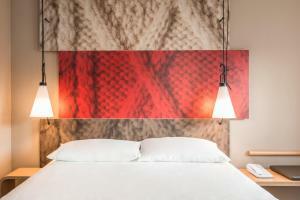 Free Wi-Fi access is provided throughout this ibis hotel. Public parking is possible near the hotel, with an extra cost. Poissonnière Metro Station (Line 7) is 200 metres away and gives direct access to the Opera Garnier and the Louvre. Please note that one extra bed for a child under 12 years old or one baby cot can be added in certain room types upon prior request. The extra bed or baby cot is subject to availability. Rate: € 73.80 ... € 170.00; select dates below to get current rates.